Netflix is increasing its subscription prices again, with the company’s Standard package bumping up 18 percent from $10.99 per month to $12.99 per month on Tuesday. 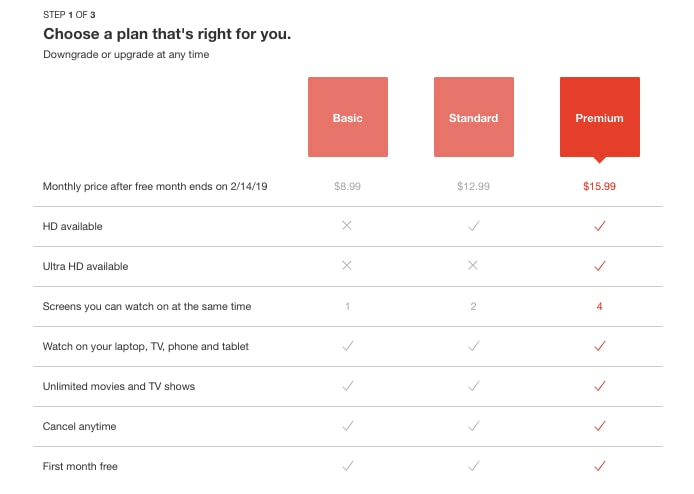 The company’s Premium plan, which includes up to four HD streams, moves from $13.99 a month to $15.99 each month, while its Basic plan increases $1 per month, hitting $8.99 each month. The new prices will impact new subscribers immediately, while existing customers will be moved to the new rates in the coming months, according to a Netflix spokesperson. “We change pricing from time to time as we continue investing in great entertainment and improving the overall Netflix experience for the benefit of our members,” the Netflix spokesperson told TheWrap. While streamers might not love the price hike, Wall Street did, with Netflix’s stock jumping 6 percent to $353 in early-morning trading. The Los Gatos, California-based company is set to report its Q4 financials on Thursday. The price raises, between 13 and 18 percent, reflect the biggest increases in Netflix’s history. Netflix last raised its prices in late 2017, with its Premium plan increasing about 17 percent from $11.99 to $13.99 each month at the time — its biggest increase until Tuesday. Existing Netflix customers will receive a heads up email ahead of their monthly increase, according to the Netflix spokesperson. The price increases will hit Netflix’s U.S. subscriber base — 58 million accounts when the company reported its Q3 earnings back in October — and Latin American and Caribbean countries where Netflix bills customers in U.S. dollars, including Barbados, Uruguay and Belize. The increases won’t hit markets like Mexico and Brazil. Even after the hikes, Netflix’s monthly fee is still in-line with its competitors: HBO Now runs customers $15 each month, while Hulu’s ad-free streaming costs $13 per month. Netflix will likely use its new monthly revenue — which could easily pass $100 million each month — to pay for content and offset its mounting debt. Netflix raised $2 billion in debt in late October, weeks after the company reported it had $8.3 billion in long-term debt at the end of Q3.